Guam offered 1/3 of their island. RMI negotiated Kwajalein and a history of nuclear tests. Saipan gave up Tinian, potentially Pagan, and Farallon de Medinilla. Palau serves as a jumping off point into Asia as the westernmost country under a compact agreement. FSM, as a four state country offers the largest strategic denial for the US military. Depending on how Chuuk negotiates with the FSM, an independent Chuuk may become sandwiched inside a US controlled Micronesia, with international waters to the south. Chuuk may also become one of the smallest countries in the Pacific. 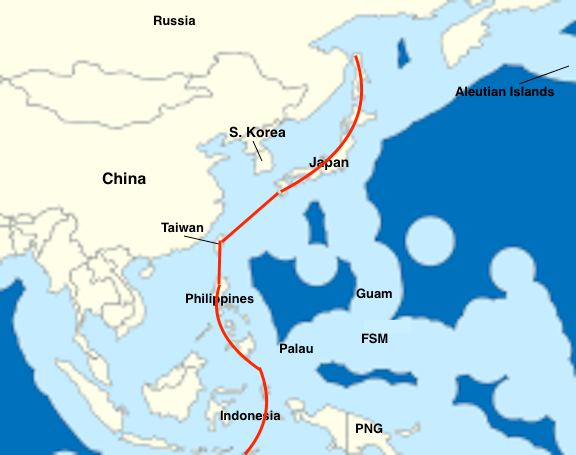 (Red lines mark US controlled waters, yellow lines depict what an independent Chuuk may look like. Green lines mark international waters). If Chuuk becomes independent it could potentially be the smallest country in Micronesia after Nauru. It would also be sandwiched between Yap and Pohnpei; two states that an independent Chuuk would have to negotiate exclusive economic zones (EEZs) with. An independent Chuuk will have to negotiate with Pohnpei and Yap over the size of its territory. Exclusive economic zones stretch 200 miles from a country's coast. Overlapping EEZs will need to be negotiated. Reefs may also be negotiated. The US has occupied or allied with key territories throughout the Pacific and beyond. Strategic alliances/territories stretch from the Aleutian Islands to the north, to Japan, the Philippines, Indonesia, and Australia to the south. to borrow a term, "like an iron-curtain", the United States has stretched a divide to ensure that any conflict with Asia can be dealt with overseas. Away from the continental United States. Micronesia serves as an additional buffer. So what would an independent Chuuk use as incentive to pull off a successful compact deal with the USA? Will they have to give up an island like Guam and CNMI in exchange for funds? If so, which island can they lease, and if inhabited, where will the inhabitants relocate to? Pagan island (CNMI), a 10 mile island that the US military wants to use for military exercises, is bigger than the island of Weno. An aggressive leader would feign a negotiation with another country, for example China. This provocation can serve as a bluff to intimidate the USA into signing a deal. But is that really what Chuuk wants to do? Provoke world powers? Possibly start a new missile crisis? And even if Chuuk does the unlikely, and signs a pact with another super power, Chuuk's geographic location in the middle of the FSM will work against it. The US can call for an embargo and box out (strategic denial) any ships or planes from entering Chuuk. As shown above, no Asian country can travel to Chuuk without crossing into a US allied or occupied country/territory. What will Chuuk have to offer the USA to form their own compact?